I've been on a quick bread bender. 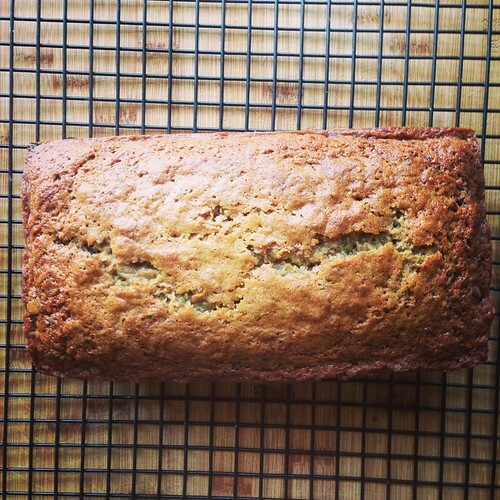 In the past few weeks I've made Coconut Brown Butter Bread, Banana Chocolate Chip Bread, and now, Zucchini Bread. Lately I've been making sure to set aside some of my precious nap time me-time for kitchen adventures and it's done wonders for my mental state. Some people need exercise or a stiff drink to blow off steam; I need to bake. I can't wait til my little munchkin is old enough to be my sous chef. In the meantime, she got her very own little play kitchen this week and it's so fun to watch her play house! 1. Adjust oven rack to middle position and preheat to 350F. Grease an 8 1/2 by 4 1/2 inch loaf pan. Shred the zucchini using your food processor or the large holes of a box grater. Squeeze the shredded zucchini between several layers of paper towels to remove excess moisture. 2. Whisk the flour, baking soda, baking powder, cinnamon, allspice, and salt together in a large bowl. In a medium bowl, whisk together the sugar, melted butter, eggs, yogurt, and lemon/lime juice until smooth. Gently fold the yogurt mixture and shredded zucchini into the dry ingredients with a rubber spatula until just combined. Do not overmix. Gently fold in the chocolate chips. 3. Scrape the batter into the prepared pan and smooth the top. Bake until golden brown and a tester comes out with just a few crumbs attached, about 1 hour. 4. Let cool in pan for 10 minutes, then turn out onto a cooling rack and let cool for 1 hour before slicing and serving.